Shown here are various stages of the lost wax casting process. 1. We begin by making a silicone rubber mold. 2. 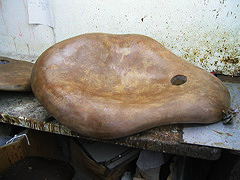 Hot wax is poured into the mold and allowed to cool until a thin layer (3/16th of an inch) forms on the mold's surface. The mold is then emptied, removing all the excess wax. 3. After the wax has cooled it is pulled from the mold to be cleaned and detailed. 4. At this point the wax is ready to be gated or sprued. 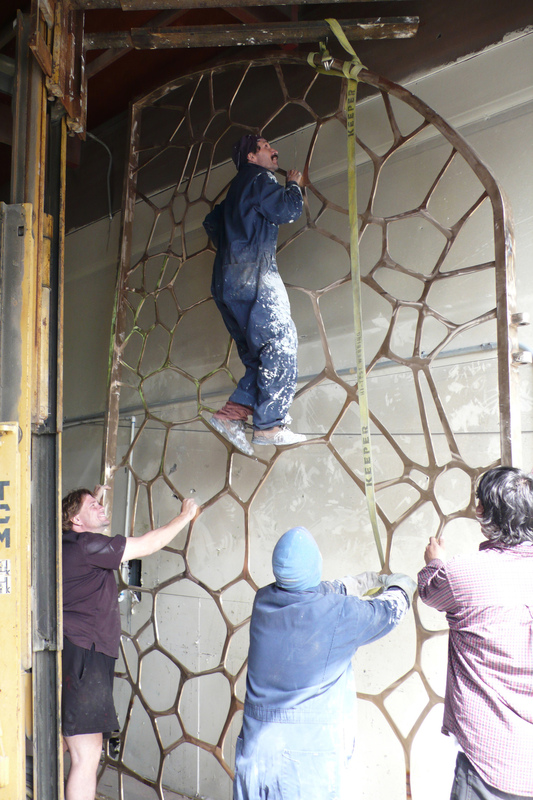 This involves attaching wax bars at strategic points to the sculpture, enabling the metal to flow evenly into the shape. This is a critical part of the process. 5. After the piece has been gated, it is dipped in a ceramic slurry and sprinkled with 3 different types of sand; fine, medium and rough. The fine and medium sand is for the detail, the rough sand is for the strength. 6. After 10-12 coats, the piece is then put in the oven and dewaxed. This also strengthens the ceramic shell which enables it to receive the molten bronze. 7. After the ceramic shell is dewaxed it is then filled with molten bronze or aluminum during the pouring process. 8. After the metal has cooled, the ceramic shell is knocked off. 9. The pouring cup and gating bars are then cut away from the sculpture. 10. After the required welding and surface finishing is complete, the piece is ready to be patinaed. In addition to traditional lost wax casting, Artisan Bronze will shell, burnout and pour numerous other organic materials including wood and foam.